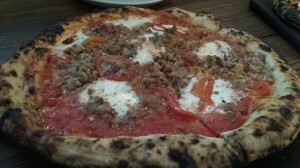 Summary : The nondescript, tiny space in the heart of Austin serves a small selection of solid Neapolitan style pizzas. If you need a break from barbecue, this is a good spot to check out. This fall I made my first trip to Austin, Texas — one of the better food cities in the United States. One thing that Austin is not known for? Pizza. I was down there partially to cover Pizza Hut’s launch of their new 3 Cheese Stuffed Pizza, but was certainly not going to make that the only pizza I had during my trip. 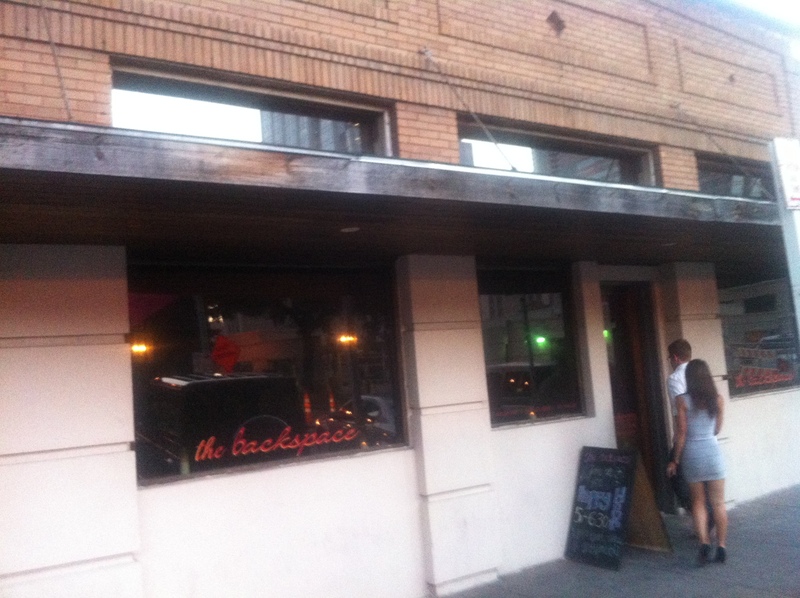 So on a Friday evening around 6:00PM some friends and I stopped by The Backspace (507 San Jacinto Boulevard) based on their recommendation. The nondescript place is located right in the heart of Austin — about 30 steps from the main drag of loud and boisterous bars on Sixth Street — however in terms of ambiance it couldn’t have been more different. The first thing you’ll notice when you step inside is that the restaurant is very small — 30 seats to be exact. And while they do take reservations, according to their website tables can only be reserved for 75 minutes (the menu is even less generous noting that “we reserve our tables for about an hour”). I’ve never seen a restaurant publish a maximum table limit! Truth be told, the service was good and the pies come out in a matter of minutes, so any party that is there beyond that time frame is probably lingering a bit too long. The inside is almost as bear as the facade. There are wooden tables along with wooden booths and chairs, a few bar stools, some exposed brick, and low lighting. You don’t feel like you’re around the corner from establishments like The Dizzy Rooster, Blind Pig Pub, Buckshots, and Bikinis Sports Bar & Grill (note: these are all actual establishments around the corner!). There are about a dozen appetizers (antipasti) on the menu, along with some shared plates like cheeseboards, but we went right for the pizza. 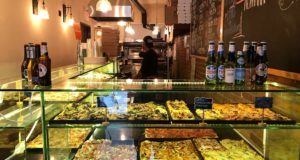 The menu changes a seasonally, but when I was there there were six pies available: marinara, margherita, fennel sausage, pepperoni americano, and bianca. In keeping with the theme of simplicity, none of the pies are too complex. 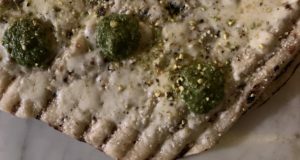 They all contain either three or four ingredients. In fact, there are only 14 ingredients in total — and that includes items like thyme, garlic, and basil. You can also add prosciutto or a baked egg to any pie for an additional charge. Pies top out at a very reasonable $15. We opted for one Margherita and one Fennel Sausage. Both were delicious. 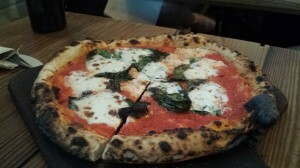 They were generous with the ingredients and the puffy crust was on par with some of the better Neapolitan pies I’ve had. Again, The Backspace keeps things simple and because they only serve six pies, they are able to focus on making each of the great. If you only have a couple of days to visit Austin, you shouldn’t get pizza. 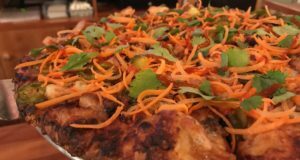 Your time should be spent eating barbecue (Franklin’s), tacos (Tacodeli) and checking out some of the hundreds of food truck around town. 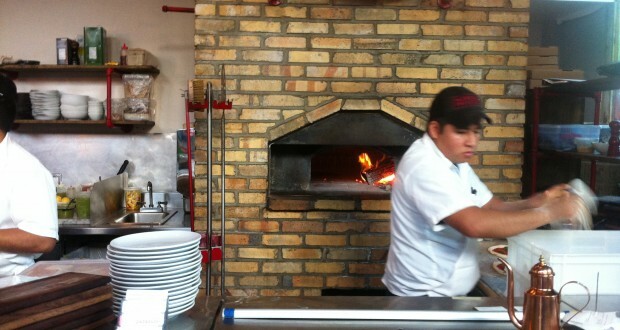 But if you live in Austin — or are spending an extended period of time there — you have a venerable pizza place to hit up. Austin is not synonymous with pizza, as it is with some other cuisines, but it’s good to know that a solid, simple Neapolitan style pie can be found right in the heart of the city.